I was reading the report on the meeting with Manny Gonzalez and saw this: "Leaves and yard waste should be put in the garbage bins." Maybe Manny G said this (and sorry I missed it if he did) but this is incorrect. I am not sure about the "encouraged" statement below, but from my understanding it has been against the law since the late '90s to put yard waste in with regular garbage. It is supposed to be separately collected. In Beverly (the south side neighborhood which is well-known as having good recyclers and lots of single family homes with big yards and gardens), people are allowed to just designate one of their supercarts as a "yard waste cart." I think this is a great idea: It saves buying the brown bags, and even though it's OK to put it in plastic bags, who wants more plastic in the world? Another option is a composting site in the city, where the yard waste is taken and composted, and then people can come and get the compost, wood chips etc. This happens all over the U.S., in cities large and small. Evanston in fact has such a system. Why doesn't it happen in Chicago? I could tell you my opinion, but I think what we need to be asking is, why not? It's a win-win: saves money and energy, and produces a useful green product from waste materials. In areas of Chicago with the Blue Cart program, the Department of Streets & Sanitation picks up recyclables and yard waste separate from the garbage. Areas that are not yet on the Blue Cart Program can recycle by bringing recyclables to any of our 38 Regional Blue Recycling Drop Off Centers. Use of the Blue Bag for Chicago's residential recycling was discontinued in 2008. Those in a Blue Cart area are given a blue recycling cart to deposit recyclable materials including paper, cardboard, plastics, glass, tin and aluminum. Material placed in the blue cart can be loose or bagged and there is no sorting needed. While you do not have to rinse containers before they are put in your blue cart, you could opt to do so to avoid smells if you store your recycling in your home. Please make sure all items are emptied before being placed in the blue cart. Please flatten all boxes, like cereal boxes, to save space in your cart. Large cardboard boxes can be placed next to your cart. Your blue cart will be emptied by the Department of Streets & Sanitation on an every other week schedule. If you have curbside garbage service, your blue cart will be emptied the same day as your garbage. 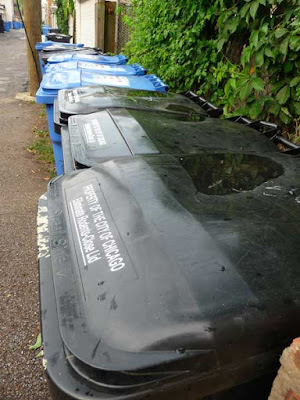 If you have alley garbage service, your blue cart will be emptied during the week of collection. Between April 1 and November 30 of each year, residents in the Blue Cart area are encouraged to place their yard waste (grass clippings, leaves, weeds, etc.) in paper (preferred) or plastic bags and place it next to their carts. If you are in a Blue Cart service area then Yard Waste is now collected every other week by our yard waste crews, pick-up will be on the same week as your blue cart collection. There is no change in garbage service. While the Department of Streets and Sanitation tries to make recycling, yard waste and garbage pick up on the same day, this is not possible in all areas. Yard waste is picked up on a seasonal basis between April and November.